We already know Jerome Simpson can flop. It turns out he can flip also. Ok, yes. In my previous post, I blamed the Simpson-flop on Fujita’s Jedi powers. So, maybe he can’t actually flop. Nonetheless, I feel compelled to post a quick analysis of this flip. You know, just to provide full coverage of Jerome Simpson. Here is the flip. Wow. He stuck that landing, right? No. He put his hand on the ground. I am pretty sure that would count the same as a fall. Impressive anyway. Now for an analysis. Sometimes, I start with a question. For this motion, let me just create a plot first. Of course, I will use Tracker Video. This video isn’t too bad as far as analysis goes. Most football videos have some type of weird camera angle. For this one, the camera seems far enough away to not matter too much. Oh, if you want to analyze a video like this with Tracker, let me suggest that you use calibration point pairs. Trust me on this one. Here is my first plot. This is the horizontal (x-axis) motion of my guess for Simpson’s center of mass (which I approximate as being around his waist). Why isn’t this a constant x-velocity? First, while he is running, he doesn’t have to have a constant x-velocity because he can push on the ground (and the ground can push on him). In the air, his horizontal velocity SHOULD be constant. In this case, the non-constantness of his speed could be due to my estimation of his center of mass. His center of mass should have a constant x-velocity, but not all parts of his body. Here is an example where the center of mass does move as expected. Although I suspect the problem lies with the center of mass, it could also be a perspective problem. 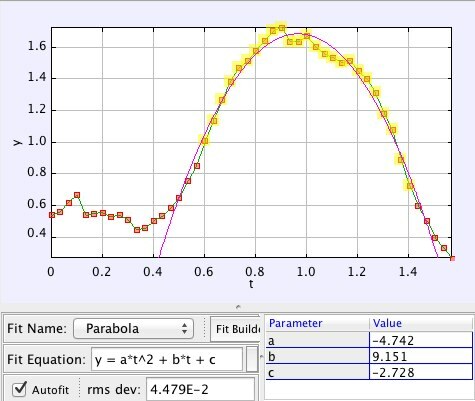 Oh well, here is a plot of the vertical motion. Ok, it looks like this turned out a little better. Here you can see the vertical acceleration of Simpson while in the flip is about -9.4 m/s2. This is pretty close to the expected value for the vertical acceleration of a free falling object – about -9.8 m/s2 Now for some almost random questions. How high did he jump? I guess the real question would be: what was the vertical change in height for his center of mass. Looking at the vertical position data, it looks like the change in height for his center of mass is about 0.46 meters (18 inches). Is this a good jump? I guess so. However, it isn’t a world-setting record or anything. I looked at Dwight Howard’s jump and he has a change in center of mass around 1 meter. How do you do a front flip anyway? Why did I just calculate that? Not sure – it doesn’t really show too much. Whenever I look at some sports topic, I think to myself “what would Sport Science do?” Sport Science would want to have one number to represent this awesome move. If I had to guess, they would either use power or force (pretty sure those are their two favorite things). So, how about I calculate the power Simpson would need to do this? What is power? Basically, it is the change in energy over time. How much work in how much time. Using my values, I get a change in energy of 486 Joules. Now for the time. How long does the “jumping part” of the motion take? Well, the pushing off the ground part takes about 0.133 seconds. Of course during this time he is probably just “jumping” and not rotating (I think I made a mistake by including the rotational energy). Let me just use a change in energy of 423 Joules. With that time, I get a power of about 3000 Watts. So, there is your number.